The Madrid Regional Government, through the Consorcio Regional de Transportes de Madrid (CRTM), continues to foster intermodality by the combined use of bikes and public transport. Recently, it has launched the REB Plan (Red de Estacionamientos para Bicicletas or Bicycle Parking Network), and has expanded some sections of Metro where bike users can access without time limitation. The Bicycle Parking shelters of the REB Plan are located in the surroundings of Metro entrances and the Transport Interchange stations. Each point has an information panel where users can get data about bikes access to the area, or advice about the parking security of the bicycle, as well as the parking rules included in the REB Plan. The REB Plan started operating in March 2016, since then the Madrid Regional Government has installed 18 bike parking throughout the capital. The estimation for the next three years is to reach up 800 bike parking spaces. This action is going to take place in phases and will benefit 180.000 potential users in the Madrid region. Moreover, during past September the Madrid Regional Government increased the number of Metro lines sections where the bikes can travel without time limitation. With the addition of 50 new stations, the users of Metro and Light Rail can access with their bicycles to a total of 92 stations corresponding to 12 Metro line sections, without any time restriction. 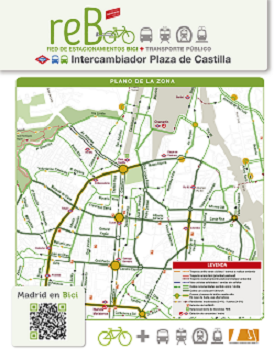 This new action allows the bike users to cross the M-40 ring road of Madrid, and facilitates the access by bike to the city center to people coming from other municipalities of the Madrid Region. The CRTM is also working with different municipalities of the region to integrate the public bike sharing systems in the Public Transport Card. Currently, the system of the Getafe Municipality (GBici) is already integrated, and similar projects are being studied for other municipalities like Rivas Vaciamadrid, Leganés and Majadahonda.